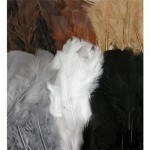 Guinea fowl feather Natural 10gm .. 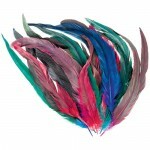 Bright large assorted colours - 30gm ..
Coloured large - 60gm ..
Natural Feathers - 60gm .. 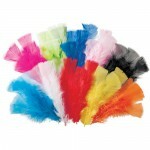 CONTENTS: Shredded Foil, Joggle Eyes, Chenille Stems, Foam Sheets, Shredded Coloured Paper, Pom Poms, Feathers, Sequins, assort Shape Collage Boards. 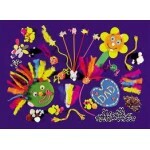 Every teacher and student will enjoy this sizzling, colourful collection of collage materials, joggle eyes, assorted chenile stems, foam sheets, ..